Bodies of victims littered on the grounds. PHNOM PENH (Cambodia Herald) – The opposition Sam Rainsy Party has commemorated the 15th anniversary of a grenade attack on March 30 in 1997 which killed at least 16 people and injured more than 100. About 100 lawmakers and activists from the party attended Friday's ceremony in front of the former National Assembly. Speaking by video conference from France, where he is in exile, party leader Sam Rainsy said justice was a long time coming. "The international community will not forget the grenade attack in Cambodia," he said. At the ceremony, the families of victims appealed to government to open an investigation and apprehend the assailant and those who ordered the attack. PHNOM PENH (Cambodia Herald) – ASEAN foreign ministers will discuss the South China Sea when they meet in Phnom Penh next week, the Ministry of Foreign Affairs and International Cooperation said Saturday. In a statement, it said the meeting chaired by Foreign Minister Hor Namhong (pictured) on Monday would exchange views on regional and international issues and the ASEAN constitution. Other issues include Pakistan's request to be a dialogue partner of the Association of Southeast Asian Nations. Foreign ministers will also examine a draft declaration for a Drug-Free ASEAN in 2015 to present to a summit of ASEAN leaders on Tuesday and Wednesday, the statement said. Islands in the South China Sea are claimed in whole or in part by ASEAN members Brunei, Malaysia, the Philippines and Vietnam as well as China and Taiwan. PHNOM PENH (Cambodia Herald) – Non-government organizations have various views about the current four-day visit of Chinese President Hu Jintao to Cambodia ahead of next week's ASEAN summit in Phnom Penh. Some doubt Hu will discuss the South China Sea, a strategic area claimed in whole or in part by China, Taiwan and ASEAN members Brunei, Malaysia, the Philippines and Vietnam. "It will take time, tolerance and concessions to solve the problem of the China issue," said Cambodian Human Rights and Development Association President Thun Saray (pictured). "Cambodia is just a coordinator," Thun Saray said. "The countries involved in the dispute should have joint ownership of the sea if concessions are not recognized." Thun Saray expressed concern, however, over human rights and democracy in China and the risk that Cambodia could adopt similar policies as the two countries cooperate closely. Independent analyst Chea Vannat said Cambodia is no different from other countries with which China is building ties, adding that Cambodia wants political and economic stability. Silika Director Thida Khus said Hu's visit to Cambodia was good to deepen cooperation but said Cambodia had to prioritize ASEAN benefits. Koy Koung, spokesman for Ministry of Foreign Affairs and International Cooperation, said Cambodia and China were good partners, with China provide assistance especially in the areas of irrigation and hydropower. PHNOM PENH (Cambodia Herald) – Boeng Kok [Boeung Kak Lake] residents held a rally near Calmette Hospital behind the French Embassy on Saturday to discuss a petition to visiting Chinese President Hu Jintao. Tep Vony, a representative of the residents, blamed Chinese property development for land conflicts at Boeng Kok. The development of the area under a 99-year lease is being undertaken by Sukaku Inc Company in cooperation with Chinese companies. Chinese President Hu Jintao arrived in Phnom Penh on Friday for a state visit aimed at enhancing the comprehensive strategic partnership of cooperation between China and Cambodia. Hu was warmly greeted at the airport by Prince Ranariddh, chief adviser to the Privy Council, Princess Buppha Devi and Prince Chivanmonirak on behalf of King Norodom Sihamoni. In a statement released at the airport, Hu said he was delighted to visit the country at the king's invitation. He lauded the China-Cambodia friendly relationship as a good example of equality and sincere cooperation between countries, adding it served the fundamental interests of the two countries and their people, and also contributed to the stability and prosperity of the region. The good-neighborly friendship, nurtured by the older generations of leaders of both countries, had withstood the test of time and entered a new historic period after the establishment of a comprehensive strategic partnership of cooperation in 2010, Hu said. "I am ready to have an in-depth exchange of views with Cambodian leaders on issues of mutual interest in a spirit of consolidating the traditional friendship, deepening the mutually beneficial cooperation and promoting common development," he said in the statement. During the visit, the first by a Chinese head of state in 12 years, Hu will meet King Sihamoni, Senate President Chea Sim, National Assembly President Heng Samrin and Prime Minister Hun Sen.
"I'm also looking forward to learning more about the time-honored history and brilliant culture of Cambodia as well as the great progress and changes the country has achieved," Hu said. The Chinese leader also expressed confidence his visit would bear rich fruit and contribute to the long-term and steady growth of the comprehensive strategic partnership of cooperation between the two countries. Cambodia is the third and final leg of Hu's three-nation trip. He flew into the Cambodian capital from New Delhi after attending a meeting of BRICS, which groups the world's top emerging economies of Brazil, Russia, India, China and South Africa. Before that, he participated in the Nuclear Security Summit in Seoul. China and Cambodia have developed growing ties, with fruitful cooperation in the fields of trade and economy, security and culture among others. The two sides have maintained close communication and coordination in regional and international affairs. China's President Hu Jintao (L) tossed with Cambodia's PM Hun Sen (R) at the Peace Palace in Phnom Penh on 31st March, 2012. PHNOM PENH | Sat Mar 31, 2012 (Reuters) - Chinese President Hu Jintao asked close economically Cambodia on Saturday not to push talks on the vexed issue of the South China Sea "too fast" as he pledged to double bilateral trade to $5 billion and announced fresh aid to the impoverished country. Cambodia holds the rotating chair of the 10-member Association of Southeast Asian Nations (ASEAN) this year, giving it influence over the agenda and talks over resolving growing tensions in the disputed maritime area. Hun Sen told Hu that while other ASEAN countries would likely raise the issue at the body's two-day summit in Phnom Penh starting on Tuesday, Cambodia shared China's belief that the issue should not be "internationalized," according to Sri Thamrong. 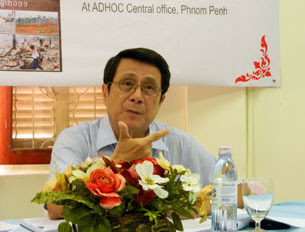 Phnom Penh has already said the issue is off the official agenda for the meeting. The Philippines and Vietnam have accused China of flexing its military muscles over the region believed to be rich in energy reserves and which has seen a rise in naval brinkmanship among the three nations in recent years. Hu told Cambodian Prime Minister Hun Sen that China wanted to move toward finalizing a code of conduct in the South China Sea but not "too fast" so that the dispute does not threaten regional stability, Hun Sen's advisor Sry Thamrong told reporters after the leaders' meeting in Phnom Penh. That would risk worsening a divide in ASEAN over how to handle the decades-old territorial dispute at a time when Washington is refocusing its military attention on Asia and strengthening its alliance with the Philippines. China, which says it has sovereignty over the sea and the islands within a looping "nine-dashed line" on its maps, rejected a Philippine proposal within ASEAN in November to define contested areas and allow joint development. The two leaders agreed to target a doubling in bilateral trade to $5 billion by 2017, according to Cambodia's top government spokesman Khieu Kanharith. China has pledged more than $2 billion in aid to Cambodia since 1992, mostly in soft loans, Cambodia's government says. China's foreign direct investment in the country was $1.19 billion in 2011, almost 10 times that of the United States, according to an estimate by the government's Council for the Development of Cambodia. Yon Chreng, a young Cambodian-American who tried to flag down a dangerous driver and was dragged to his death, will be honored this weekend. A funeral service will be held this Sunday, April 1st, for Yon Chreng, who was killed by a hit-run driver he tried to flag down and stop on a Long Beach street last week. Chreng, 27, who is known as Eley, was fatally injured by the driver of a green Dodge pick-up truck that struck the car of Chreng's girlfriend at 12:50 a.m. Saturday in the 1100 block of Stanley Avenue. Chreng ran out to the street upon hearing the crash, tried to flag down the driver and instead, was intentionally hit and dragged several feet. The driver hit three more cars. Long Beach Police Department detectives are still searching for the driver, who abandoned the truck and fled that night. --The service is from 12:00 p.m. to 3:00 p.m.
His cousin Phalika Chhuon, of Belmont Shore, said Chreng is survived by his parents, nine siblings, and "many nieces and nephews who are confused and questioing where their uncle has gone, is he ever coming back?" sisters. Neighbors, family and friends. Nieces and nephews. UNITED NATIONS (Reuters) - U.N. Secretary-General Ban Ki-moon announced on Friday that he would appoint two new judges for Cambodia's troubled U.N.-backed Khmer Rouge war crimes tribunal and urged the government of the Southeast Asian nation to cooperate with them. Swiss judge Laurent Kasper-Ansermet quit as reserve co-investigating judge of the tribunal earlier this month, while his predecessor, German judge Siegfried Blunk, left the post in October. Critics have accused Cambodia of trying to stop further probes of cases tied to the communist-inspired Khmer Rouge's rule of the country between 1975 and 1979, in which as many as 2.2 million Cambodians were killed. "The circumstances that have given rise to these two resignations remain worrying," Ban's office said in a statement. 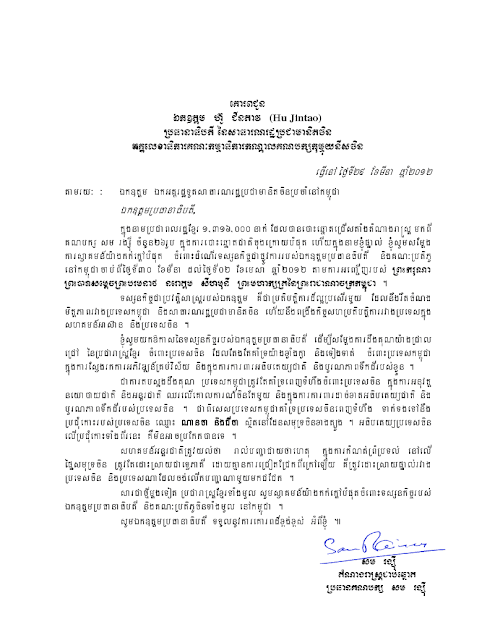 The Cambodian government has issued no comment on the resignations. But Prime Minister Hun Sen, himself a former Khmer Rouge soldier, in 2010 told Ban that more indictments were "not allowed" and has also said he would be happy if the court left. Kasper-Ansermet had been pursuing two unidentified suspects in the highly controversial cases known as 003 and 004. "The Secretary-General believes that it is essential that the judicial process in relation to Cases 003 and 004 be brought back onto a positive course," said Ban's office, adding that he would appoint a new international co-investigating judge and a new reserve co-investigating judge for the U.N.-backed court. "Their selection by the Secretary-General will not by itself, however, fully address the concerns that have arisen in regard to the judicial process in these cases," the statement said. "It is essential that the Royal Government of Cambodia extend full cooperation to the new judges." The U.N.-Cambodian court is now hearing case 002, involving the three most senior surviving Khmer Rouge cadres, who are accused of war crimes, genocide and crimes against humanity. Pol Pot, the architect of Cambodia's "Killing Fields," died in 1998. The court has spent more than $150 million since it was formed in 2005, passing just one sentence, a 35-year jail term, commuted to 19 years, for Kaing Guek Eav - "Duch" - for his role in the deaths of more than 14,000 people at a torture center. That sentence was extended on February 3 to life imprisonment after an appeal by the prosecution. Ban's office noted the court, known as the Extraordinary Chambers in the Courts of Cambodia, faced a serious funding challenge and he encouraged U.N. member states to provide funds. Sok Thoeun, 40, reportedly chained his 13-year-old son to a tree as punishment for skipping school to play online games. A father in Cambodia reportedly chained his teenage son to a tree to punish him for skipping school to go to play online games, police said Thursday. The 13-year-old was chained to a tree by his neck for nearly two hours before neighbors called the police and a locksmith came to free him, AFP reports. "The father was so angry that he found his son at an Internet cafe instead of at school that he chained him up in public for people to see, to teach him a lesson," Battambang deputy police chief Cheth Vanny told AFP. The boy's father, Sok Thoeun, reportedly fled the scene after the incident. He is now wanted on child abuse charges. "He is still on the run," an official told AFP. "This kind of torture is not acceptable." Students from Washington and Cambodia pose at the school in the village of Pailin built in part with money raised by the Overlake School in Redmond. In a lesson showing just how far one unlikely idea can travel, 18 upper affluent kids from suburban Seattle are this weekend en route to Cambodia, where they will teach science, art and English to some of the poorest children on Earth. Foreign aid is a messy business, often stymied by inefficiency and corruption. But students from the Overlake School in Redmond wave off such concerns – not to mention parental worries about residual landmines and mandatory inoculations. They believe their two-week trip to the village of Pailin will benefit them as much as their young pupils. Her confidence is based on three previous visits that Overlake kids have made to the elementary school halfway around the world since 2003. See more pictures and read the rest of the article here. LONG BEACH - In the absence of a Cambodian New Year parade this year, organizers of the fourth annual Cambodia Town Culture Festival are expecting a big turnout for the daylong event Sunday. "We've gotten a lot of feedback," said Richer San of Cambodia Town Inc., which is co-sponsoring the event. He predicted up to 2,000 visitors could attend. A variety of music, fashion and dance presentations will be held on the main stage throughout the day and about 60 booths will be on the site with artisans and performers providing exhibitions and information on a wide array of art forms from Cambodian culture. "This year will be very special," San said, noting that for the first time representatives for Cambodia's Islamic community, or Cham, have said they will attend. Another first will be a YMCA documentary, "A Cambodia Journey: Cambodian- American Experience," which will be aired twice during the day at the Manazar Gamboa Theater in MacArthur Park. Other arts and cultural demonstrations will include Cambodian court dance and costuming, drawing, shadow puppets, music and musical instruments, textiles, dressmaking, weddings, games and food-tasting. Sunday, 9 a.m. to 4:30 p.m.
Where: MacArthur Park, 1321 Anaheim St.
At least three female garment industry workers were beaten during a strike in Phnom Penh, Cambodia on Tuesday. The women were members of the Coalition of Cambodian Apparel Workers’ Democratic Unions at Win Shintex, a Hong Kong-owned factory that produces clothes for J.C. Penney Co Inc. They were marching from the factory to the Ministry of Labor as part of a strike for higher wages and improved working conditions. Workers in the country’s $4 billion garment industry have been negotiating with management companies for the past year. Eyewitnesses at the protest confirm that police used weapons and brutality against the workers, but Win Shintex and J.C. Penney have yet to release official statements regarding the issue. PHNOM PENH, Cambodia (MindaNews/30 Marcj) – Southeast Asia’s independent civil society groups are poised to proceed with their planned boycott of a dialogue with the Association of Southeast Asian Nations (ASEAN) heads of states here next week to protest Cambodia’s intervention in the selection process for country representatives to the meeting. Civil society leaders attending the three-day ASEAN Civil Society Conference and the ASEAN People’s Forum (ACSC/APF) 2012 here reiterated such move as they decried the Cambodian government’s move. The meeting is among the sidelights of next week’s 20th summit of ASEAN leaders and heads of states. They described Cambodia’s actions as an “effort to stifle the real voices of the people” within the 10-nation regional bloc. “ASEAN leaders deserve to hear the real voices of the people, especially those of communities affected by government policies such as land and mining concessions. They must take these voices seriously and act urgently to address the many issues that are affecting millions of lives in Southeast Asia,” said Thida Khus, director of Cambodia’s Silaka and member of the ACSC/APF steering committee. The 8th edition of the ACSC/APF, which is considered as the biggest gathering of independent civil society organizations in Southeast Asia, formally opened at the Lucky Star Hotel here on Thursday despite alleged efforts by the Cambodian government to block the holding of the event. Civil society groups had been holding the ACSC/APF since 2005 as a venue for discussions on issues and concerns affecting various sectors as well as for the nomination and selection of country representatives to the interface dialogue with the region’s leaders. But on Wednesday, a separate three-day gathering of supposed civil society groups in the region apparently backed by the Cambodian government opened at the Chaktomuk Conference Hall here. Organizers, which claimed support from various civil society and non-government groups across the region, also dubbed the event ACSC/APF 2012 and carried its official logo. She said they have been coordinating since January with Cambodia’s Ministry of Foreign Affairs for the holding of the ACSC/APF but the latter allegedly refused to acknowledge them. They invited Cambodia’s Deputy Prime Minister Hor Namhong and officials from the Ministry of Interior to address the ACSC/APF opening ceremonies on Thursday but none came, she said. As in the past gatherings, ASEAN Secretary General Surin Pitsuwan was invited anew by the organizers to address the gathering and hold a dialogue with them but they were so far informed that he could not come due to his “busy schedule,” Thai representative Chalida Tajaroensah told MindaNews. She said they were still trying to reach out with any one of the four ASEAN deputy secretary generals to attend the closing ceremonies on Saturday. Sinapan Samydorai, Singapore’s steering committee representative, claimed that the Cambodian government had even tried to “disrupt and interrupt” the holding of this year’s ACSC/APF. He said local organizers initially promised a week ago by Cambodian officials that a permit would be issued for the event but it did not release them until noon on Wednesday, delaying their preparations at the venue. Yuyun Wahyuningrum, who represents Indonesia in the ACSC/APF steering committee, said they were initially barred by the management of the Lucky Star Hotel to enter the venue hours before it opened on Thursday supposedly due to the lack of proper clearance from Cambodia’s interior ministry. She said they were later allowed to proceed with their preparations at the venue following negotiations made by Cambodian civil society leaders. She pointed out that ASEAN was supposed to have adopted the dialogue interface with the civil society as one of the mechanisms of the socio-cultural pillar of the ASEAN Charter, which was formally adopted in late 2009. “It now appears that they’re back to their old ways…of being a centric-oriented organization. Everything about ASEAN is just really about governments and not about its people,” Yuyun said in a press conference. “Their actions were different from what was outlined in the ASEAN Charter. They don’t really acknowledge the genuine voice of the people,” she added. “This (gathering) is no doubt the real representation of the ASEAN civil society and the people,” she said. Parong, who is also the Amnesty International-Philippines director, said the Philippines civil society bloc has no idea yet if they would be tapped for the dialogue with the ASEAN leaders next week. “We will be meeting later on to decide among ourselves what actions to take regarding the dialogue,” she said. The DFA’s move was contrary to Cambodia’s request to its ASEAN colleagues to disregard the ACSC/APF’s nomination and selection process of representatives for the dialogue. “In fairness to the DFA, they did not push us to attend the other ACSC/APF backed by Cambodia. No organization from the Philippines also decided to go there,” Parong added. Meantime, organizers of the Cambodia-supported ACSC/APF claimed they were the “real voice” of the ASEAN civil society and would bring the “real concerns of the people” to the upcoming dialogue. Khieu Vicheanon, deputy director of the Cambodia-ASEAN Centre for Human Rights Development, said they were given clearance by the ASEAN Secretariat through Cambodia’s Ministry of Foreign Affairs to select the country representatives for the dialogue. He claimed their own version of the civil society gathering has the support of various organizations in the region except for Brunei Darrusalam. But he failed to name any representative from the Philippines when asked by Filipino reporters. The gathering, which was attended by only around 200 people and mostly Cambodian university students, laid out a program that were dominated by Cambodian speakers. Chinese President Hu Jintao arrived in Cambodia today. Photo Phnom Penh Post. PHNOM PENH (Cambodia Herald) – Chinese President Hu Jintao arrived in Phnom Penh Friday ahead of an ASEAN summit next week amid concern that he will use his visit to convince Cambodia as ASEAN chair to avoid discussion of the South China Sea issue. China's influence runs deep in Cambodia as the government depends heavily on Chinese aid as well as economic and political cooperation. Such influence has raised concern that it could have a negative impact on Cambodia's role as ASEAN chair, especially on the South China Sea conflict. Ahead of Hu's visit, Chinese Ambassador Pan Guangxue held a press briefing to highlight the strong cooperation between the two countries. Pan depicted China as one of the most important countries for Cambodia in terms of political relations, aid, trade, and investment. He noted that bilateral trade had jumped more than tenfold from $224 million in 2000 to $2.5 in 2011 and that China had also contributed $2.1 billion in aid to Cambodia since 1992. Cambodia's national budget for this year meanwhile includes plans to request $767 million in loans from China. Chinese aid to Cambodia has been channeled towards roadworks stretching 1,800 kilometers and six big hydropower projects. Another four hydropower projects are underway. In addition, China is helping Cambodia to construct three irrigation systems, a bridge across the Mekong River and another bridge across the Tonle Sap River -- next to an existing bridge built with Japanese assistance. Chinese companies are also the largest source of foreign investment in Cambodia with investment reaching $8.8 billion between 1994 and late 2011, the Council of Development of Cambodia says. Such investment includes the infrastructure, hydropower, agriculture and light manufacturing sectors. Pan estimates that Cambodia has about one million Chinese immigrants, mostly businessmen, among its population of more than 14 million. In ceremonies to inaugurate the many projects funded by China, Prime Minister Hun Sen always highlights the strong friendship and cooperation between the two countries. In the village of Kuok Snuol, not far from Siem Reap airport, small groups of elders arrive to greet former Khmer Rouge village chief Van Chhuon, 64. Some still call him may, or boss. The villagers claim that, during the time of the Pol Pot regime’s bloodiest purges, Van Chhuon saved many of their lives. Their conspicuous respect for him is genuine, and moving. In 1970, Van Chhuon lived in the village of Kompong Tkov as a peasant farmer. He knew many of the KR guerrillas, local teenagers mostly recruited from the surrounding area. He’d watched as American B-52 bombers saturated the nearby jungle with bombs, but usually failed to kill either the guerrillas or the North Vietnamese soldiers who crossed into Cambodia on propaganda or recruiting missions. In Kompong Tkov, he met his wife, Yim Hoy, who had fled the fighting in her own village. They were married in a Buddhist ceremony in 1971. But fierce fighting between the KR and Lon Nol’s troops soon followed, and the couple were forced to flee. Several times, the guerrillas pressed Van Chhuon to dig graves or carry the dead and wounded from the battlefield. In 1974, in a makeshift hut in the village of Dumbrai Goan (elephant baby), Yim Hoy gave birth to their son, Chen Heng. The couple hid in bomb crat-ers to shield their cooking fires from passing aircraft and supplemented their diet with frogs, insects and lizards. After the Khmer Rouge victory on April 17, 1975, they were sent to the village of Kuok Snuol. The Khmer Rouge organised the villages into sangkats, or communes. Sangkat Siem Reap was comprised of 10 vill-ages, whose chiefs reported to the commune chief. The vill-age of Kuok Snuol had about 100 families. Yim Hoy, meanwhile, served food in Kuok Snuol’s communal kitchen. “The people asked that I work there because I always gave out fair portions,” she explains. “The Khmer Rouge did not allow anyone to possess rice, and hiding food was punishable by death. In September, 1977, the revolution turned on itself. Fanatical new troops from Takeo province seized the preceding KR soldiers, village and commune chiefs, drove them away in trucks, then butchered them. “The dogs always knew when people were being killed,” says Van Chhuon. “They would howl to each other, from village to village – a very spooky howl, unlike anything I ever heard before. The villagers identified Van Chhuon, who was then designated village chief. His first task was to bring Ta Khan, the deposed commune chief, to a meeting at the KR commune office in Teuk Vil (now the Paradise Eco Resort). Obsessed with internal enemies, the Khmer Rouge ordered all village chiefs to report anyone suspected of disloyalty, hiding food or being pro-Vietnamese. Van Chhuon explains: “Some village chiefs reported people out of fear. They thought that if they didn’t find any enemies, the KR might suspect them. Van Chhuon was given the power over life and death. He chose life. In a village matter, Doan, the brother-in-law of sugar-palm climber Ta Kuol, 65, had been known to sexually service not only the village widows but also the wife of a village man. Ta Kuol says: “Doan knew he would be arrested, so he climbed to the top of a palm tree, threatening to jump off and kill himself. We talked him down, and then went to see Van Chhuon. Defying the Khmer Rouge for two stress-filled years, Van Chhuon ensured that his villagers hid extra rice in the watery gruel they were allowed to eat, and that people hid extra food outside of their houses, as Khmer Rouge spies would search them while people were out working. To avert suspicion, Van Chhuon would tell his villagers in speeches that if they stole a potato, he would bury them in the potato field. Or if they stole a banana, they would be buried under the banana tree. After that, whenever the KR came to arrest someone, Van Chhuon told them they’d already been taken, or that nobody by that name lived there. Although Van Chhuon had no powers to protect prisoners, he successfully argued for Nai’s life. Two months later, he went to pick him up. “When I saw Van Chhuon on his bicycle, I couldn’t believe it,” remembers Nai Kong. “He assigned a villager to take care of me, and I ate many duck eggs. “One year later, Van Chhuon showed me my name on a list of people to be arrested. He had a tear in his eye. But five days later, the Vietnamese came and the Khmer Rouge ran away. Ironically, Nai Kong is the current village chief of Kuok Snuol. Before this interview, he and Van Chhuon had not seen each other since January, 1979. “When the Vietnamese tanks came in January, 1979, I ran into the jungle to hide, because people were taking revenge on the Khmer Rouge. Some village chiefs were hacked to pieces with machetes. Thirteen years later, in 1992, Van Chhuon asked for two men to help him build his house in Siem Reap. Forty-five villagers showed up, led by Ta Kuol. They brought a lot of food. Startled neighbours thought it was a demonstration. In a way, it was. By all accounts, Van Chhuon lost only one person while he was the village chief of Kuok Snuol – Ta Khan, the former commune chief. Myanma's moves toward economic and political reform would not subtract from Cambodia’s regular stream of foreign investment, experts and insiders said – at least not in the short run. Word of an investor-friendly Myanmar has spread quickly with the US’s partial waiver on trade sanctions in early February, and some of the region’s business players have called the country “ground zero for investment”. But Cambodia’s more than decade-long claim to political stability should eclipse Myanmar’s piecemeal reform, which a regime change in late 2010 set into motion after nearly 50 years of military rule. “Political stability is the hot button for Cambodia, where they have gotten it right for foreign investors, and that’s a place where Myanmar can’t really compete yet,” Gordon Peters, manager at Emerging Markets Consulting in Cambodia, said this week. Myanmar may be turning some heads, but there will not be a flight of investment dollars that were originally destined for Cambodia, he said. If Cambodia were to lose foreign direct investment (FDI) to Myanmar, it would likely be from the Kingdom’s garment manufacturing sector, worth US$4.25 billion in 2011, or 32.1 per cent of gross domestic product. An increase in tourists to Myanmar would inevitably translate into more tourist dollars to Cambodia, Peters said. Angkor Wat will remain one of the main destinations for tourists in the region, whether travellers land in Yangon or Phnom Penh. Still, Cambodia’s advantages as an investment destination are debatable. Analysts at US financial services company Standard and Poor’s have called Prime Minister Hun Sen’s hold on power a cause for concern about – rather than a sign of – political stability. Laws on oil extraction, telecommunications regulation and much of the country’s tax regime remain in the draft phase, with some stagnating for more than a decade. “Cambodia’s challenges to maintain a strong investment climate are quite well known by now: to address governance and corruption, to improve logistics and transport costs, to build a stronger skill base, and to address the concerns of fiscal space,” Peter Brimble, senior country economist for Asian Development Bank in the Kingdom, said this week in an email. Any pull Myanmar has on FDI in the region would be temporary, and the country’s emergence will stimulate growth throughout Southeast Asia, Brimble said. However appealing Myanmar’s recent reforms seem, continued progress is still far from guaranteed, Business Research Institute for Cambodia CEO and chief economist Hiroshi Suzuki said. “I have concerns about the stability of Myanmar politics. I’m afraid that there could be some backlash from older generations, such as the army, who are not satisfied with the current reform,” he said. Myanmar’s investment climate may need five to 10 years to catch up with Cambodia, with large holes in law and regulation awaiting repair, he said. Local businessmen in Myanmar have expressed a greater degree of faith in their new government’s ability to attract FDI. “The new government will be able to amend the laws on investment. They are more and more flexible with businesses interested in Myanmar,” U Hla Maung Shwe, a prominent Yangon-based businessman, said yesterday by phone. While acknowledging the large discrepancies between investment in the two countries, U Hla Maung Shwe said Myanmar would become a competent source of competition in about two years. Human capital, he claimed, was more advanced in Myanmar than it was in Cambodia. Despite other threats such as sustained economic crisis in the West, Cambodian officials have maintained a cool mien on the possibility of a new regional star. “We’re happy rather than concerned with [Myanmar’s] political and economic reform,” Vongsey Vissoth, secretary general of the Ministry of Economy and Finance, said this week on the sidelines of the 16th ASEAN Finance Ministers’ Meeting in Phnom Penh. PHNOM PENH—Chinese President Hu Jintao arrived in the Cambodian capital on Friday on a state visit to bolster ties between the already close nations, just days before Phnom Penh hosts a key regional summit. Hu’s four-day trip comes as Beijing’s shadow looms large over next week’s gathering of the 10-member Association of Southeast Asian Nations (Asean), where the thorny issue of the West Philippine Sea (South China Sea) is likely to resurface. The first visit by a Chinese head of state to Cambodia in 12 years is timed to showcase Beijing’s close relationship with the current Asean chair, observers say, and perhaps encourage his hosts to keep the maritime row off the summit agenda. “He’s here to remind Cambodia he’s a good friend,” a Western diplomat who did not wish to be named told Agence France-Presse, likening the eye-catching timing of the stay to “marking one’s territory”. China and Taiwan claim all of the West Philippine Sea, while four Asean countries — the Philippines, Vietnam, Malaysia and Brunei — have overlapping claims to parts of it. The region is a conduit for more than one-third of the world’s seaborne trade and half its traffic in oil and gas, and major petroleum deposits are believed to lie below the seabed. Beijing opposes internationalizing the conflict and prefers to negotiate with its weaker regional neighbors individually rather than collectively, and Phnom Penh is unlikely to challenge that stance during its Asean chairmanship. “Cambodia does not want to use Asean to square up against another country,” government spokesman Khieu Kanharith told AFP. China is Cambodia’s largest bilateral creditor as well as its biggest foreign investor, with hundreds of Chinese companies pumping billions of dollars into the impoverished nation in recent years, including in key infrastructure projects such as hydropower dams and coal power plants. Hu, fresh from attending a nuclear security summit in Seoul and a gathering of emerging economies in New Delhi, is expected to sign a raft of cooperation agreements with Cambodia before leaving on April 2, a day before the Asean summit opens. SA KAEO, March 30 – A Cambodian court on Friday temporarily released four Thai miners charged with illegal entry pending a court verdict. The four are two couples, Saran and Suriya Panphet, both 43, Sa Kaeo natives and the mining contractors, and their assistants, Bai Sodachan and his wife, Ms Wanwisa, both 24. Cambodian border officials handed over the four to senior Thai officials at the Bantaphraya-Buengtakuan border crossing after they were temporarily released Thursday evening. They were fined Bt1,600 each for leaving the country without permission. Pol Lt-Col Benchaphon Rodsawat, deputy superintendent of the Sa Kaeo immigration police said the four were released on bail and their Cambodian lawyer is now fighting the case. The court in Sisophon, the Banteay Meanchet provincial seat, is awaiting relevant documents from their employer before delivering the verdict. President Hu Jintao today becomes the first Chinese head of state to visit Cambodia in 12 years, in a trip days before Southeast Asian leaders gather for talks that may touch on territorial disputes in the South China Sea. Hu’s visit, which lasts until April 2, will deepen ties between Cambodia and China, its largest investor, the official Xinhua news agency reported March 27, citing the country’s ambassador in Phnom Penh, the capital. China appreciates Cambodia’s support on core interests, the report said, adding that China opposes outside interference on the South China Sea. “Cambodians will not want to upset the Chinese by pushing the South China Sea on the agenda of the Asean meeting,” said Ian Storey, a senior fellow at the Institute of Southeast Asia Studies in Singapore. In the past two years, previous hosts Vietnam and Indonesia “really pushed the issue, so that momentum will slow under a Cambodian chairmanship,” he said. Vietnam and the Philippines have pushed the 10-member Association of Southeast Asian Nations to take a common position regarding territorial disputes in the South China Sea, where Exxon Mobil Corp. and Talisman Energy Inc. (TLM) are searching for oil and gas. Cambodia holds the bloc’s rotating chairmanship. The South China Sea contains oil reserves that may total as much as 213 billion barrels, according to Chinese studies cited in 2008 by the U.S. Energy Information Agency. China used patrol boats last year to disrupt hydrocarbon survey activities in waters it claims, chasing away a ship working for Forum Energy Plc (FEP) off the Philippines and slicing cables of a survey vessel doing work for Vietnam. The Philippines said in January it’s ready to host a summit to help resolve territorial disputes in the South China Sea. China must meet with the countries claiming part of the sea “under the guidance” of Asean as soon as possible, Foreign Affairs Secretary Albert del Rosario said on Jan. 15. From the stage to the dance floor, all eyes are on Sophea Rous’s captivating moves and heart-rending voice. Is a jump to the silver screen next? At a dance club on Sihanoukville's beachfront, the audience steps back to take in his seductive and captivating dance moves. The self-taught wonder moves instantaneously with the beat of the music. Men and women watch as he rolls his torso, bends his back almost in half, and shakes his hips. A foreign male takes a step forward for what seems to be a dance-off. Sophea watches. His eyes betray his chain of thought – feet this way, hands the other. He responds to the move with perfection – just as he has done copying the moves of belly dancers, along with the likes of Shakira and Britney Spears. The singer, songwriter, dancer, and possible actor and model, featured on The Idol's second season and made it to the top five. While he didn’t win, he has risen to new heights since. Last weekend saw Sophea perform at Angkor Beer’s 45th anniversary in Sihanoukville, alongside fellow Idol competitors and top artists like Sok Sophea and Karana Pich. Like every performance he delivers, Sophea gave it his all, bringing with him individuality, style and one hell of a voice. Since January, Sophea and his competitors have been on a whistle-stop tour of 15 provinces with The Idol. He has two shows remaining, after which he says he can focus on what direction his career will take. The future is abundant with opportunity for Sophea since he made his break, but behind his intriguing Mediterranean good looks, smooth dance moves and a boyish charisma, is a story of bleak perseverance. Born in Kampong Cham province, Sophea never met his father and was raised by an alcoholic mother. "I never saw her sober, she was always drinking,” he recalls, adding that he would often go to school with no food and just 300 riel in his pocket. Despite having step-siblings, Sophea's birth outside of marriage left him feeling never fully integrated into his family, and with a deep desire to find his father. "I just want to see my father's face, to see how he looks," he says. After his family moved to Phnom Penh, his mother’s drinking spiralled out of control, and violent outbreaks became common at home. He says this violence was the trigger for forcing him to leave home as a young teen. “[The violence] made me want to go to the pagoda and learn about monks,” he said. He stayed there for eight months, learning Pali and other languages. Then, an aunt told him to leave and work at her husband’s silk shop. He lived and worked at the shop for no salary, but insists it was worth it because he was able to study Khmer and English. Sophea knew he wanted “freedom”, and it was from there his life began to turn around. He left the silk shop to work at a tailor’s shop, making costumes for the likes of the Phnom Penh Pussycats. In 2005 Sophea graduated from the Golden Star club with a certificate in singing, and began taking an interest in dance. He began singing on youth television programmes, was featured in Khmer music videos, and picked up supporting roles in comedy and horror movies. Sophea has performed in numerous nightclubs in the capital, including Riverhouse Lounge, Star Palace, Emerald Club, DJ Club, MStyle, Classic, Olympic and Anyclub. Currently, he performs at Pontoon’s “Shameless” Thursdays. He has a list of international DJs waiting to produce house remixes with him to be played at Pontoon, Heart of Darkness and the Riverhouse Lounge on White Label, and has even been asked to represent Cambodia at Mr Universe. He had to decline because of a clash with Idol commitments. Sophea also has his eye on casting for the yet-to-be-named Bollywood Khmer musical with Princess Soma Norodom. “This is my dream,” he said. With everything opening up for the star performer, and fans greeting him wherever he goes, Sophea remains down to earth. “Follow your heart. Even if you can’t see where you are going, just go and believe in yourself. Everything that you want to do you should do – because you need to keep moving forward, you don’t need to go back,” he says, with a glimmer in his eye you can’t forget. The propeller in the cage behind his back in full swing, Teng Peng Seang was gliding in the sky with excitement while gazing down at the fields of Meanchey district’s Boeung Snoar commune, a half-hour’s drive from Phnom Penh. Teng Peng Seang, a master’s graduate in space technology, is the director of Phnom Penh Geoinformatics Education Centre, the first company to produce and assemble paramotors in Cambodia. In the last decade, paragliding was forbidden by local authorities along with a tranche of other risky sports. Now free to practise his hobby, the 50-year-old pilot says he is not afraid of the risks because he has been paragliding for 10 years already. The paramotor built and used by Teng Peng Seang consists of a frame that combines the motor, propeller, harnesss seat and cage. It provides two attachment points for the flaps of a paraglider wing that allow for powered flight. The pilot controls thrust via a hand-held throttle and steers using the paraglider’s brake toggles in a manner similar to sport parachutists. “This is the first time that paramotors have been used in Cambodia after 10 years of developing the technology,” Teng Peng Seang said. The man who loves to spend his free time paragliding also hopes to share his passion for flying with other daring people by producing his paramotor and introducing it to a wider market. In the past decade, he and his employees have constructed six paramotors which are now ready for use. His 10 employees not only learn how to produce the paramotor, but are also trained how to operate and manoeuvre the vehicle. Five of them are able to glide professionally like Teng Peng Sean. All the materials to produce the vehicle are found in the local market rather than being imported from abroad. According to Teng Peng Seang, his Cambodian paramotor is about half as expensive as those produced in other countries, with his company retailing them for $US3,000-$4,000 compared to $5,000-$6,000 in the West. With this reasonable price, Teng Peng Seang believes that paramotor has a bright future in Cambodia’s leisure market. “I hope in the future I can build small-scale factories in Phnom Penh, Siem Reap and Sihanoukville because these are all the famous tourism destinations in the country,” he says. Teng Peng Seang says that paramotor is a great leisure activity that melts away stress from work and refreshes mind and body. He says that while there are 24 paragliding clubs in Thailand, the one he has established is the first here, and he hopes that the activity will prosper in the years ahead. However, he also warned that before jumping on a paramotor, it was vital that people were confident in their ability to operate and manoeuvre the vehicle. Otherwise, a day’s paragliding could end in a lifetime’s paraplegia. Vietnam has seen a growing trade surplus with Cambodia in recent years with more and more Vietnamese goods becoming popular in the Cambodian market because of their quality and reasonable pricing. However, to maintain a sustainable growth rate of 35-40 per cent a year in exports to Cambodia, Vietnam needs to overcome many shortfalls. The current ‘Ho Chi Minh City Expo 2012’ in Phnom Penh City in Cambodia from March 28 to April 1, has 150 Vietnamese companies displaying a variety of products in 200 booths. Within three hours of its opening ceremony, many Vietnamese booths had already run out of stocks as many Cambodian visitors flocked to the Expo. Vietnamese companies have provided many new products in this Expo that are attracting Cambodian customers, who seemingly prefer products that are made in Vietnam to those from their own country. In addition, many Vietnamese products are already brand names in Cambodia, such as Vinamilk, Kinh Do cakes, Vissan, Thien Long ball-point pens. Vietnam’s major exports to Cambodia include instant noodles, plastic products, tobacco, confectionery, corn seed, household products and vegetables. Imports from Cambodia include raw material for the textile and garment industry, automobile spare-parts, rubber and timber. According to Kep Chuktima, Mayor of Phnom Penh, Vietnamese products are cheap and with acceptable quality. A number of high-quality Vietnamese products have become quite popular in Cambodia. A representative of the Yen Sao Khanh Hoa Company said that even though their company entered the Cambodian market only two years ago, it has already been successful in capturing the market. Participating in the Expo will be a good opportunity to promote their products in the Cambodian market. The Thien Long Pen Company is currently one of Vietnam’s leading companies for stationery items. Doan Xuan Nghi, head of the company’s office in Cambodia, said that within nine years the company has an export turnover of US$1 billion. Mayor Kep Chuktima said that Vietnamese companies need to focus on packaging, design and quality to create a strong impression on customers in Cambodia and secure a strong foothold for Vietnamese products in the Cambodian market. Experts say that to penetrate the Cambodian market, businesses must establish a distribution network for export products; advertise Vietnamese brands; ensure a good image and maintain prestige while continuing to introduce more new products to the Cambodian retailer. When new products are introduced, customers should be allowed to sample the products. Currently, a number of Vietnamese entrepreneurs are keen on setting up business in Cambodia. The country also has at least 50 on-going projects in the neighbouring country, such as rubber plantations, telecom, tourism, garments and mining. Many Vietnamese banks have opened branches in Cambodia, such as Agribank, BIDV, Sacombank, MB bank and SHB bank. Your song . . .
Cambodian Prime Minister Hun Sen’s regime has got a superficial boost from a recent “Open Letter” written by a member of Australia’s Democratic Socialist Perspective. The letter brought a wave of negative reactions from regime opponents, whose attention was diverted momentarily from their usual focus on the regime’s violations of civil rights and the rule of law. 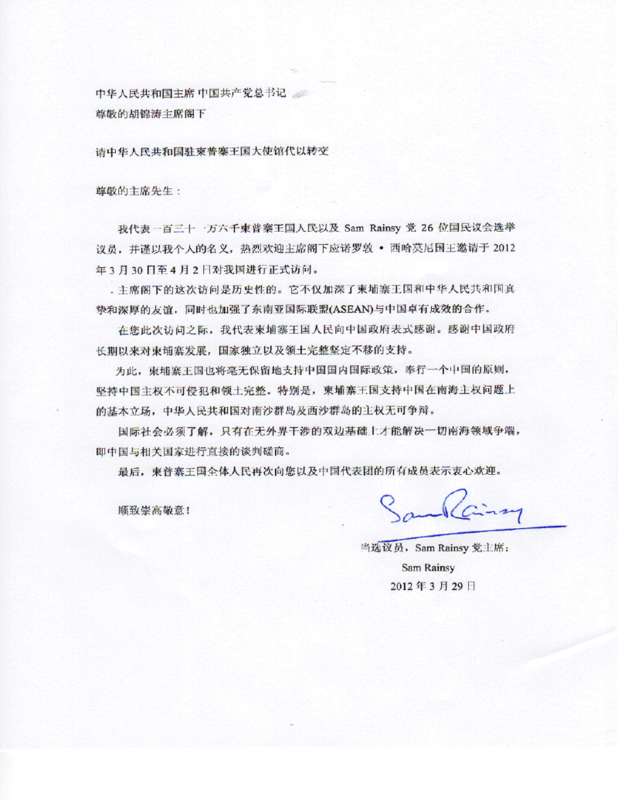 The Open Letter (to self-exiled opposition leader Sam Rainsy) was relayed to me by email from a high ranking member of a Cambodian royalist faction in Phnom Penh who wrote: “The government has the means to hire and employ little known western ‘reporters’ to write articles in favor of them. There are many people like this for sale in our country…” A string of communications from Cambodian expatriates expressed indignation against the letter’s author. I commented to a Cambodian elder with long experiences in Cambodia’s affairs since the 1950s that Cambodians should not be pulled away from their focus on civil rights by this distraction engineered by the prime minister. The letter describes a “vibrant press” in Cambodia and the regime in power as representative of the “expressed will of the majority” of voters in the elections of July 27, 2008, though the Election Observation Mission of the European Union, which had a mandate to “conduct a comprehensive assessment of the electoral process in accordance with international principles for genuine democratic elections,” reported the 2008 elections “fell short of a number of key international standards for democratic elections.” “[T]here was a lack of confidence in the impartiality of the election administration among election stakeholders. The campaign was marked by consistent and widespread use of state resources by the governing party and the distribution of money and gifts by candidates and party officials was widely reported,” the EU-EOM’s Final Report said. Human Rights Watch reported the 2008 elections were “marred by the [Cambodian People Party]’s near monopoly over the media, bias within the electoral apparatus, and coerced defections of opposition Sam Rainsy Party (SRP) members to the CPP [through] [l]ucrative offers of high-paying government positions and threats of reprisals…” Et cetera. “Cambodia continued to drift toward authoritarianism in 2008 as Prime Minister Hun Sen and his Cambodian People’s Party (CPP) consolidated power through flawed elections in July . The elections were criticized by the European Union and the United Nations special representative for human rights in Cambodia for failing to meet international standards,” says HRW. Yet, again, four years later the Phnom Penh Post of 15 March 2012 reports in “Top officials accused by election watchdog,” that Committee for Free Elections (COMFREL) in Cambodia distributed a detailed list of names of more than 100 high-ranking CPP and Royal Cambodian Armed Forces officials who used certain state properties on specified dates between September 2011 and January 2012 on behalf of the governing party, including breaching election laws by delivering gifts to citizens. Cambodian Defender Project executive director Sok Sam Oeun reminded, if an RCAF two-star general goes to the grassroots and tells people to support the ruling CPP, citizens who fear him would do as told. Fear and intimidation that breed obedience do not represent the “will” of the people. The regime’s Press and Quick Reaction Unit spokesman Ek Tha declared, the CPP “has not abused the law and has not taken state properties to propagandize for its interests.” What else could he have said? But there are other matters to be concerned about in Cambodia. The 22 March annual report by rights group ADHOC alleges the Ministry of Agriculture, Forestry and Fisheries has given 2.3 million hectares of land, or about 14.7 percent of Cambodia’s total land mass, to 225 domestic and international companies in economic concessions in 2011 for “agro-industry development,” and that the 2.3 million figure is on the low side, since other government ministries also have given out land concessions. ADHOC’s report included land concessions that were not approved through the public legal processes in place, finding irregularities in at least 123 of the 225 concession grants, concessions that bear no proper names of companies involved, concessions that encroach on preserved forests and national parks. These “land grants” trample on the civil and economic rights of all Cambodian citizens and have particularly angered the villagers whose rural properties are often affected. Land reform project coordinator for the Cambodian Center for Human Rights, Ouch Leng, was reported in the Post to claim that so far in 2012 the government has given 65,066 hectares of economic land concessions to 14 private companies inside national park and wildlife sanctuaries in Preah Sihanouk, Kompong Speu, Siem Reap, Mondulkiri, Preah Vihear, Kratie and Kompong Thom. Donald Frazier’s “China to Gamblers: Come to Cambodia” in Forbes.com of 21 March is disquieting: The government is selling off more than 130 miles of national park land to Chinese developer Tianjin Union Development Group, which plans to spend $3.8 billion to build a city-sized complex with an international airport and a dock for cruise ships surpassing in size the world’s largest casino, the Venetian in Macao! On 22 March, the Phnom Penh Post’s “Watching a country change” quoted UNICEF country director Richard Bridle, who spoke at Phnom Penh’s Raffles Le Royal Hotel lobby about “the alarming inequality that is growing” in Cambodia: “The gap between those who are very rich and those who are very poor is worrying and it is a gap that is widening.” It is not just a widening wealth gap but also an ethical issue. Bridle’s concern about the widening inequality is supported by a non-Cambodian professional with long experience working with peoples in developing countries who referenced data drawn from the World Bank: Although poverty in Cambodia has been reduced between 1993 and 2007, a third of Cambodians still live below the national poverty line (2,473 riel or US$0.61). The inequality levels have increased dramatically, WB data show. The Gini Coefficient has moved up from 0.35 in 1994 to 0.40 in 2004 and 0.43 in 2007 (0 being perfect equality and 1 being absolute inequality). Even within the rural areas where some 80 percent of the people live, rural inequality rose from 0.27 in 1994 to 0.33 in 2004 and climbed again to 0.36 in 2007. Also, Cambodia is among countries with the highest burden of child under-nutrition and “alarming” levels of hunger and under-nutrition in the overall population. These are among the many other problems that Cambodians inside and outside the country should be concerned about. Premier Hun Sen is doing what he can to hold on to power. As he does, the economic and social welfare of the Cambodian people is not going to improve in spite of the emerging infrastructure. This showy infrastructure represents only a mirage of development. On another hand, on 27 March 2012 Phnom Penh Post’s “Demarcation causes worry,” reported a recent Phnom Penh-Hanoi agreement on border demarcation that would reclassify some Khmer villages as being on Vietnamese territory and Vietnamese villages as being in Cambodia. This would place Khmers who never wanted to leave their homes as being on Vietnamese soil while Vietnamese nationals are legitimized on Khmer soil, a terrible mess that will haunt Khmers for generations to come. Infrastructure represents a nation’s skeleton, but the country’s territory and sovereignty, and the people’s economic and social welfare, are the nation’s soul. Today, this soul is being suffocated with Premier Hun Sen at the helm of Cambodia. Dr. Gaffar Peang-Meth holds a B.A. degree in political science from Hiram College, an M.A. from Georgetown, and a Ph.D. from the University of Michigan. He is retired from the University of Guam where he taught political science for 13 years. He is currently living in the United States. He can be contacted at peangmeth@gmail.com. As you probably know, President Hu Jintao of China is undertaking a four-day visit in Cambodia. As the Middle Kingdom plays a key role in Cambodia politics and way of life, I decide to write the article below to share my thought with all of you. As always, you comments/critics are welcome, but please avoid vulgarity and profanity in your comments. President Hu Jintao’s upcoming state visit to Cambodia this week will mark an important milestone in Cambodia foreign policy and relations. Evidently, the four-day visit is far more than just strengthening the long standing bilateral cooperation between the two countries. It also highlights the significant role of Cambodia as ASEAN chairman in helping to resolve the lingering regional issue, specifically the South China Sea dispute. Cambodia has every reason to be upbeat about the visit. While such highest-level state visit is viewed as mutually beneficial for both countries, it benefits the Cambodia side in a number of ways. In particular, it provides tremendous support to Cambodia domestic and international agendas. Diplomatically, it will boost Cambodia standing in the region, and lend a much-needed credibility for Cambodia to successfully fulfill its ASEAN chairmanship role. Being a small country in the region, it is constantly an uphill battle for Cambodia to manage its internal affairs freely from external interferences, let alone assuming a key role in regional affairs. However, strong and enduring bilateral ties with China are paving the way to change all of that, and more importantly allowing us to redefine our place and relationships with other nations in the region. It is visibly undeniable that no country in the region has so far gained from China’s economic transformation and successes than Cambodia. The Middle Kingdom has generously poured billions of dollars into Cambodia economy and public infrastructure, apparently with no strings attached according to PM Hun Sen. But that’s not all. Beyond the generous economic aids, it is China’s political commitment and steadiness toward Cambodia that make her a truly dependable friend and ally of Cambodia. To secure its future, Cambodia desperately needs a genuine friend like China whose foreign policy is steady and predictable. There are arguably no other viable options. Cambodia, in present and foreseeable circumstances, cannot afford the risk to compromise its future by relying on a major World power whose foreign policy changes from one election to another. The compelling reason is that any drastic change or reversal of foreign policy by such ally would spell disastrous consequences for Cambodia. While enthusiastically looking forward to welcome President Hu, Cambodia is equally eager to take the opportunity to become more informed about the once-in-a-decade power transfer in China starting this fall, when seven of the nine members of the Standing Committee of the Politburo are set to retire. New generation of leaders, including Vice-President Xi Jinping, Vice-Premier Li Keqiang, and other powerful figures like Mr. Wang Yang and Mr. Bo Xilai, are expected to be promoted and assume more prominent roles to succeed the current top leadership. Although it is highly unlikely that China’s next leaders will undertake major policy changes, getting to know them and how they think at the early stage is paramount to cement the existing bilateral relationship.Without a doubt, Cambodia is mindful of the delicate balance between preserving its close ties with China and fulfilling its ASEAN chairmanship responsibilities in the South China Sea dispute. Cambodia is, however, optimistic that there is enough room to achieve both. With its carefully crafted policy along with existing regional and international mechanisms, Cambodia is confident in its ability and leadership to continue to push the envelope constructively in such a way that will benefit both China and ASEAN members at large. Hun Sen and Chhouk Bandit: The boss and the bandit. A rights group and an opposition lawmaker on Thursday called on a court in southeastern Cambodia to swiftly prosecute a former city governor who is the lone suspect in a shooting incident, as victims of the attack took the stand in court in connection with the case. Moeun Tola, head of the labor program at the Community Legal Education Center, said the court should immediately arrest and try Chhouk Bandit, the former chief of Bavet city in Svay Rieng province, for his suspected role in the incident, which left three women injured as they took part in a factory strike last month. Until the accused is charged and tried, “we can’t say justice has prevailed for the victims yet,” Moeun Tola said after the court heard testimony from two of the three victims. One of the victims was unable to attend the hearing, as part of a court investigation process, due to lingering injuries sustained during the shooting. 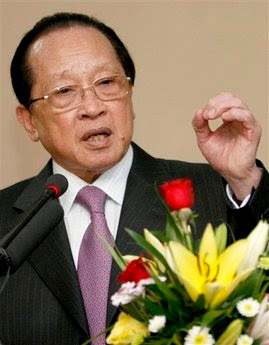 Moeun Tola said that giving Chhouk Bandit impunity would negatively affect the reputation of the Kaoway Sports Ltd. factory, where workers were striking for better conditions when the incident occurred, as well as the reputations of the factory’s purchasers, which include German sportswear giant Puma. All three victims have filed criminal complaints against Bandit for premeditated murder, seeking nearly U.S. $100,000 in compensation for medical bills and other damages. The victims said they had earlier been approached by a representative of Chhouk Bandit who offered them each a settlement of U.S. $1,000 to $2,500 to drop the case. NGO officials and opposition legislators escorted the victims to the courthouse to appeal on their behalf. “The victims are suffering to see the suspect free from prison. The suspect continues to freely travel in and out of Bavet city,” Mu Sochua said. Chief prosecutor Hing Bunchea told RFA that he would summon Chhouk Bandit for a second time for questioning, although he declined to say when. Hing Bunchea had met with Bandit two weeks ago, but allowed him to go free, telling reporters that he would not face any immediate charges, in a move that outraged NGOs and rights groups. He said that the medical condition of the victims had not yet improved, which had also delayed the investigation of the case. Lawyers of the victims complained that he had questioned their clients for too long, negatively affecting their health, the prosecutor said. “I don’t know how to speed up … The lawyers said [the victims’ health deteriorated] because I asked too many questions, so how can I speed up [the trial process]?” he asked. Factory workers Bun Chinda, Keo Nei, and Nuth Sakhorn, all aged between 18 and 23, suffered gunshot wounds as they participated in a strike by thousands of workers demanding better conditions at the Kaoway Sports Ltd. factory on Feb. 20. All three were treated for their wounds at a nearby hospital. Local rights groups said protesters had been demanding that management of the SEZ’s three factories raise their monthly wages by U.S. $10 per month to U.S. $71. According to initial reports, an unidentified gunman dressed as a bodyguard opened fire at the demonstration, but escaped from the scene despite a heavy police presence. NGOs and rights groups say the shooting case has highlighted a culture of impunity among Cambodian officials implicated in scandals and the reluctance of Cambodian courts to find justice for the victims of attacks on labor activists. Cambodia’s textile industry, which is the country’s third-largest currency earner after agriculture and tourism, employs more than 300,000 people, mostly women. Strikes and protests are not uncommon at textile factories, where laborers often work long shifts for little pay. Several murder cases of high-profile union leaders are still unresolved in Cambodia, and authorities have failed to bring suspects to trial. Free Trade Union leader Chea Vichea, whose brother Chea Mony is the current union leader, was gunned down in broad daylight in 2004. Reported by Sonorng Khe for RFA’s Khmer service. Translated by Samean Yun. Written in English by Joshua Lipes.